To the puzzlement of many, one of the first changes our new President made to the White House was sending back to Britain a bronze bust of Sir Winston Churchill that had watched over the Oval Office since the September 11th attacks. There was little explanation for this gesture, or hint of its significance. The significance of Churchill for Americans, and for all mankind, need hardly be hinted at. He was the greatest statesman of the calamitous twentieth century, and among its greatest men of letters. Fortunately, though America now lacks the bronze of the great man, thanks to ISI, a small publisher out of Wilmington, Delaware, we no longer lack a current edition of one of his neglected literary works. 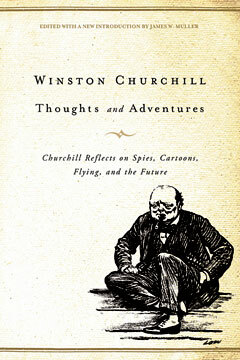 ISI has brought forth a new printing of Churchill’s 1932 collection of essays, Thoughts and Adventures, and we are all the richer for so superb and enjoyable a read. Thanks, Paul. This reminds us of the importance of not getting so caught up in whatever issue might grab our attention at the moment or whatever story might be in the news that we neglect a broader view and concentration on enduring things. Clearly, Churchill didn't, as the breadth of these essays (including the ones on painting) shows. Reading Churchill has touched you. Your article's final paragraph (which I will not spoil for other readers by quoting here) could have been written by the young Churchill, himself. You are too kind, Mr. Harrison. Churchill's style is certainly infectious though.